Located approximately 7 km from Civil Lines, it is actually the confluence of three holy rivers-Ganga, Yamuna, and Saraswati. It becomes a center of attraction for hundreds and thousands of religious travelers after every twelve years when it hosts the famous Kumbh Mela. It stands as one of the greatest tourist attractions on your tour to India. Built by Akbar in AD 1583, the Allahabad Fort exhibits fine depictions of art, design, architecture, and craftsmanship of the fort. Visitors are allowed to view the Ashoka Pillar, Saraswati Kup and Jodhabai Palace. Located inside the Allahabad Fort, this is actually an underground temple, alluding to associations with Lord Rama. The famous Akshaya Vat one of the most revered trees of the Hindus is also sited within the temple. The ancestral home of the Nehrus, the Anand Bhawan now houses a memorabilia of the Nehru-Gandhi family and one of the excellent museums of India. Located next to the Anand Bhawan, and built by Pt. Moti Lal Nehru, it is the house where the former Prime Minister of India Mrs. Indira Gandhi was born. This huge garden houses the mausoleums of Khusrau, his sister, and his Rajput mother. Situated near Chandra Shekhar Azad Park, the Allahabad Museum preserves the paintings of Nicholas Roerich, terracotta figurines, Rajasthani miniatures, coins and stone sculptures from the 2nd century BC till date. 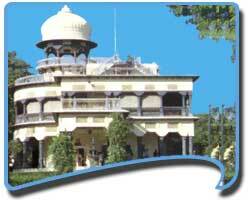 Trips to tourist attractions around Allahabad can be equally rewarding. These options include Jhusi, Kaushambi, Bhita, Shringverpur, Kara, Upardaha Lake and the Tons River Aqueduct. 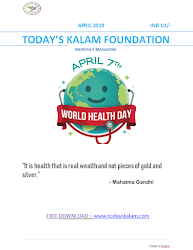 The events and festivals of any city or town are some of the greatest tourist attractions and the Kumbh Mela is the prime north Indian festival. Held once every four years by turns, on the banks of holy rivers-the Godavari in Nasik, the Shipra in Ujjain, the Ganga in Haridwar and the Sangam in Allahabad. Several travelers, priests, saints and religious seekers visit this place every twelve years with an expectation of purgation and cleansing, medically and spiritually. 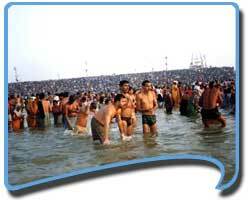 The Magh Mela is another of the fairs celebrated in the month of February.